Professional and polished with a hint of fun. Objective: Chris Shoulet contacted me because she needed to develop a professional logo for her company. Previously, she had been using a clip art dog with the name of her company typed out next to it. While she liked the look of her dog, she wanted something a less generic and with a bit more punch. I decided on the navy blue and orange, as well as a monochrome version that replaces the orange with a lighter blue. Chris and I then discussed the dog profile – at one point, I suggested that we use a pointer in allusion to the recruiting aspect of the company, but we thought the hunting reference may get in the way of what we were really trying to say. We also discussed doggy non-verbal communication – a tail pointing down symbolizes mistrust. In the end, we decided to move forward with the lab profile similar to what Chris was already using- stoic, tail up (loyal), ready stance, direct eye contact (trustworthy). I faced the dog to the right to symbolize movement forward and create better flow. To dress the logo up (literally), I added the tie. The simple addition added some whimsy to the logo while still holding on to the cleanliness and professionalism that Chris really wanted. 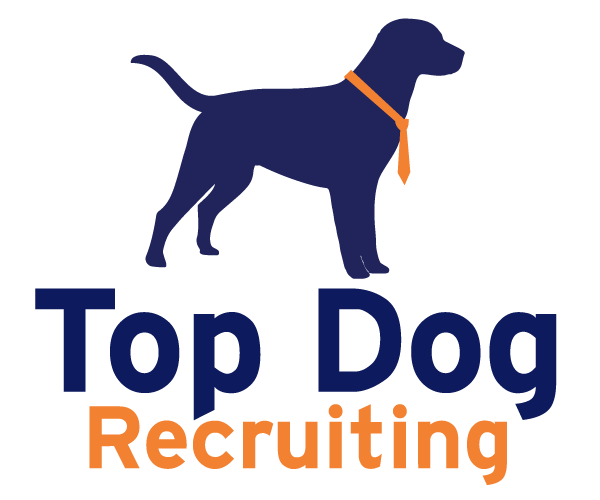 ~Chris Shoulet, Top Dog Recruiting, LLC.